Ur, situated in southern Sumeria, was a most magnificent city at the time of Abraham, with a population of 24,000. It was a centre of manufacture and farming. It was a sea port at the mouth of the Euphrates onto the Persian gulf, with trade to India and Africa. It had two dock areas, one for the city, and one for the temple. The river later silted up and changed its course, so the sea became further away. Ur lost its source of trade so became ruined, its place being taken by Babylon. It was a centre of advanced culture, where libraries of tablets containing business documents and contracts, hymns and liturgies have been found. The houses were built of brick, had two floors, with an inner courtyard, central heating, and with a sewerage system from each house. This headdress of gold leaves and precious stones was worn by Queen Shubad for her burial. 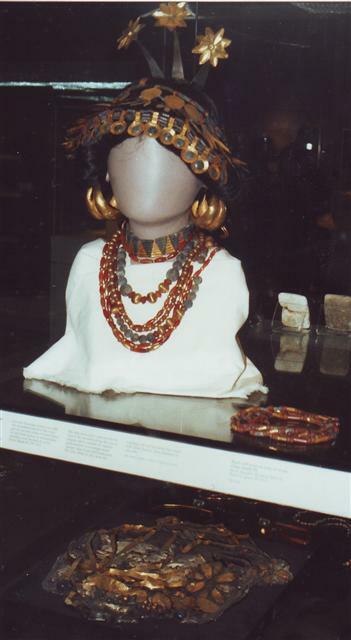 The one displayed on the head is a reconstruction of the original one, which is displayed below in the state it was discovered. The great death pit contained the bones of 74 bodies (6 men and 68 women), which were found lying in rows, the harem and servants were killed to accompany their master in the afterlife. The priests of Ur had killed young men and women to serve as "soldiers" and "servants" to attend to their queen in the afterlife. Also buried were an entire choir of talented musicians who had been killed to entertain the dead queen. There are a number of different items of jewellery displayed in this gallery, which show the level of skilled workmanship available in 2000 BC.